The latest Beta of Designer wont open any .pdfs . It goes through the standard open window and page selection with page preview and when excepting conditions nothing shows up, no document, no error - no nothing. Just tried several PDF files, and all opened fine for me in Designer beta 1.7.9.209 on Windows, including a 1900-page one that only took a minute or two. So it may be something local to you. Perhaps resetting Designer beta by starting it with the Ctrl key held down would help? 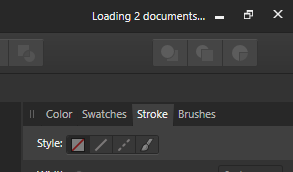 That will remove brushes you've added, and various other things, so you will probably want to export them first. This video has some pointers on doing that. Would you be able to attach some of the offending PDFs you are trying to open please? Would you be able to attach them to our internal Dropbox account please using the link below?